he circuit’s threshold is set by resistor VR1. 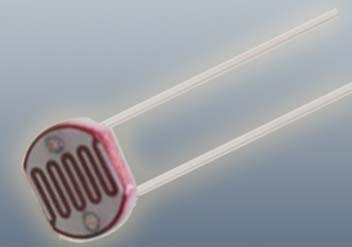 When the intensity of the light falling on the LDR is lowered, resistance of that unit increases, and lowers the voltage applied to the inverting input of the 741. The reference voltage at the noninverting input of the 741 is set (via Vr1) so that the comparator switch from low to high when the light falling on the LDR is reduced. That high activates transistor Q1, Which causes the relay contacts to close. Hi R2 should be 100 ohms not 100K ohms. Thank you Seetharaman, I correct it. Should be have the free wheeling diode? 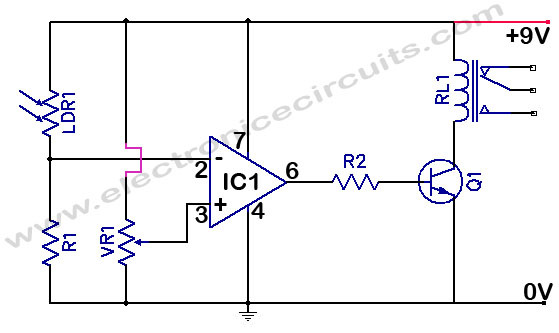 Pls can 12volts relay and power source be used for this circuit?